Browse through our range of high performance car tires that meet your specific needs. Find the right tire for your car in a few quick steps. Get up to 1,500 pesos worth of fuel card when you buy Goodyear tires! Hit the road this summer with our Buy 3, Get 1 Free promo! Learn all about the technology that goes into Goodyear tires. Learn more about our tires and how to find the right one for you. Find helpful tips for reading your tires and how to better care for them. From gas savings to driving in all sorts of road conditions, get the answers to help you face the road ahead. Get quick answers to the most popular tire questions. Find how you can drive Worry-Free with Goodyear tires. Just bought new tires? Register them here for your warranty. Got a question about your tires? We’re here to help. When is it time to look? For the most enjoyable driving experience, it’s important to replace worn tires. Optimum traction helps provide your vehicle with more responsive handling for a smoother, more reliable ride. You should always check your tires in several tread locations. Be sure to check the inner, outer, and middle grooves of each tire, as tires can wear differently on each side due to improper wheel alignment and/or low inflation. For professional help, visit a Goodyear store for a free inspection by our experts. Choosing a new tire? What should I consider? Look for tires that excel in tests for braking and handling. Let tread wear, ride comfort, noise, and rolling resistance help narrow your choices. Choosing a vehicle tire depends on where you live, weather and terrain issues, what performance expectations you have, and what your vehicle requires. Air filter. Replacing a clogged air filter can improve gas mileage that translates to fuel savings for you. Spark plugs. Worn or dirty spark plugs can cause misfiring, which wastes fuel. Replacing these per your vehicle’s owner’s manual can lead to a better performing vehicle and a better driving experience for you. Gas cap. Damaged, loose, or missing gas caps waste gas. 1 “Be Tire Smart,” Rubber Manufacturer’s Association. Tire Maintenance: How can I extend optimal driving performance and comfort? Check your tire pressure every 3,000 mi./4,500 km to keep your vehicle driving smoothly and evenly, therefore using gas more efficiently. NOTE: Tires should be inflated when cool to the vehicle manufacturer’s recommendations printed on the vehicle door placard or in your vehicle’s owner’s manual. NEVER inflate beyond the maximum limit stamped on a tire sidewall1. Rotate your tires every 6,000 – 8,000 mi./ 10,000 – 13,000 km to help equalise tread wear. Get your wheel alignment checked as specified in your vehicle’s owner’s manual, or as soon as you can feel the wheel “pull”. Visually check your tires for irregularities in tread wear as these could indicate problems with alignment or inflation. For more information, visit our Personal Tire Care section. Tire Pressure: Why is it important? Improper tire pressure can lead to a multitude of problems – from uneven and accelerated tire wear, to structural damage, and even poor gas mileage. Keeping your tires properly inflated can improve gas mileage and save you money at the pump. Goodyear recommends checking tire inflation monthly, or before a long trip. Tires should be inflated to the vehicle manufacturer’s recommendations printed on the vehicle door placard, or in the vehicle’s owner’s manual. Proper vehicle and tire maintenance is a good investment because it translates into optimum driving performance, significant cost savings, and better fuel mileage. Proper inflation is the single most important part of tire care. The inflation pressure indicated on the side of the tire is the maximum allowable operating pressure. However, it is not necessarily the right inflation for your vehicle. Always use the inflation recommended by the vehicle manufacturer printed on the vehicle door placard or in the vehicle’s owner’s manual. Always check inflation when tires are cold (i.e. when the vehicle has been driven for less than a mile or one hour or more after driving). Use a good quality tire gauge. Remember that it’s natural for radial tires to have a slight bulge in the sidewall at their proper inflation pressure. Check or adjust inflation every few weeks, before any long trip or if travelling with a heavy load. And don’t forget to check the spare! Your Goodyear dealer can answer any questions you have about tire inflation. A vehicle is properly aligned when all suspension and steering components are sound, and when the tire and wheel assemblies are running straight and true. Proper alignment is necessary for even tread wear and precise steering. Uneven front or rear tire wear, or changes in your vehicle’s handling or steering response (i.e. pulling to one side) usually indicates misalignment. Many vehicles today are equipped with rear suspensions that can be adjusted for alignment. Your vehicle may need a front-end alignment or a four-wheel alignment, depending on the symptoms you are experiencing. The moderate cost of aligning your vehicle pays for itself in tire mileage, performance and comfort. Goodyear retailers provide expert alignment and suspension service. Why do my tires need to be balanced? Properly balanced tires are important for driving comfort and long tire life. Unbalanced tires can cause vibration in your vehicle that can cause driver fatigue, premature tire wear and unnecessary wear to your vehicle’s suspension. Tires should be rebalanced at the first sign of vibrations or “steering wheel shimmy”. Vibrations may also be due to misalignment or mechanical problems so bring your vehicle down to a Goodyear retailer for a more expert diagnosis and repair. Isn’t it easy to mount a tire on a wheel? Can I do it myself? You should never try to mount your own tires. Tire mounting is something that requires experience and proper equipment. If you try to mount your own tires, you run the risk of serious injury, as well as possible damage to your tire and rim. If a tire loses all or most of its air pressure, it needs to be removed from the wheel for a complete internal inspection to make sure it’s not damaged. Tires that run for even short distances while flat are often damaged beyond repair. Most punctures, nail holes, or cuts up to ¼ inch (confined to the tread) may be satisfactorily repaired by trained personnel using industry-approved methods. Any puncture larger than ¼ inch or to the sidewall is beyond repair. Also, never repair tires that are worn below 1.6mm in tread depth. Your best bet is to make sure your spare tire is always on hand. Check it regularly for proper air pressure and be sure that it’s in good shape. Also remember to check the spare tire’s sidewall for correct inflation pressure, speed, and mileage limitations. Regular and proper tire rotation gives your tires more uniform wear. All season tires should be rotated in a “modified X’ pattern, where the tires being moved to the drive axle are crossed to the opposite of the vehicle. The remaining two tires are moved from the drive axle to the free rolling axle, remaining on the same side of the vehicle. This method ensures a more even and uniform tread wear pattern for all four tires. The only exception to this would be when using “directional” tread design tires. These tires should remain on the same side of the vehicle and be rotated straight forward and straight back. If you have a four-wheel drive vehicle, we recommend crossing both pairs of tires to their new axle positions. Tire rotation should happen at least every 10,000km for regular vehicles and every 6,000km for four-wheel drive vehicles. Check your vehicle’s owner’s manual for the manufacturer’s rotation recommendations. The first rotation is the most important. When tires are rotated, inflation pressures must also be adjusted to the vehicle manufacturer’s recommendations. How long should my original equipment tires last? Due to the variety of styles, construction features, tread compounds, vehicle applications, geographical conditions and driving habits, it’s difficult for Goodyear to provide specific mileage expectancy for any tires supplied as original equipment. However, any tire wear concern should always be presented to your local authorised Goodyear retailer for further evaluation. Many of our authorised retailers offer specific mileage warranties on several lines of tires sold as replacement, including some that are used as original equipment. These mileage warranties are administered based on the retail outlet's verification of proper tire maintenance performed. How do I know when I need new tires? Many tires have tread wear indicator bars moulded into the tread. When the tread is worn down to where you can see a solid bar of rubber across the width of the tread, it’s time for new tires. Can my driving habits affect the life of my tires? Don’t speed. Excessive heat is generated when driving at high speeds. This heat increases the rate of tire wear and reduces the tire’s durability. Don’t ride on the edge of the pavement or drive over curbs, chuckholes, or other obstructions. Must I replace my current tires with the same sized tires? Never choose a smaller sized tire than those that came with the car. Tires should always be replaced with the same size designation (or approved options), as recommended by the vehicle manufacturer or your Goodyear retailer. When buying only two new tires, should they be put in the front or rear? When radial tires are used with bias or bias belted tires on the same car, the radials must always be placed on the rear axle. Never mix radial and bias-ply tires on the same axle. When you choose a pair of replacement tires that are the same size and construction as those on the car, we recommend that you put them on the rear axle. A single new tire should be paired on the rear axle with the tire having the most tread depth. Do my new tires require special treatment? Your new tires will probably feel different from the ones that were replaced. Drive carefully as you become familiar with the new performance and handling. Take special care when braking, accelerating, cornering, or driving in the rain. These are the times when the difference will be most noticeable. Should I “mix” tire types on my new car? 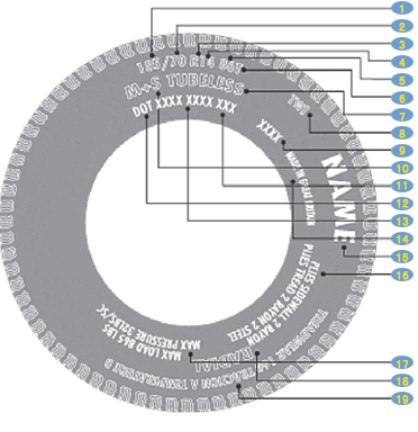 Tires of different size designations, constructions, and stages of wear may affect vehicle handling and stability. For best all-around performance, it is recommended that all tires be of the same size, construction (radial or non-radial) and speed rating. If tires of different speed ratings are mounted on a vehicle, then the same size, type and speed ratings need to be placed on the same axle. The tires with the lower speed rating should be the determining factor for permissible tire-related vehicle speed. Never mix radial and bias-ply tires on the same axle. Vibration is an indication that your car has a problem and needs attention. The tires, steering system and suspension system should be checked to help determine the possible cause and correction of the vibration. If left unattended, the vibration could cause excessive tire and suspension wear. It could even be dangerous. My tire has gone flat. Is this covered by my Goodyear Limited Warranty? Due to the variety of causes for air loss, contact an authorised Goodyear retailer to find out whether you are covered by the Goodyear Limited Warranty. Road hazard injuries (punctures, cuts, impact damage to the liner, ply material or sidewall rubber). Valve stem or valve core leakage (damaged or aged rubber stem or a loose or damaged valve core). Leaking from the bead seating area (corrosive build-up on the wheels, which prevents a proper seal between the wheel flange and the tire beads; beads seating area damage from accidental mounting or dismounting injury; foreign material between the rim flange area and the tire bead seating area; bent rim flange). What do the markings on my tire sidewall mean? Section height to section width ratio expressed as %.